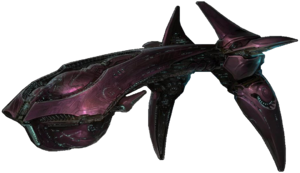 Covenant destroyer refers to at least three different warship classifications within the now-defunct Covenant fleet. There are three known classes of destroyers: the CPV-class heavy destroyer, the RPV-class light destroyer, and the super-destroyer. CPV-class destroyers were seen in various battles early in the Human-Covenant War,, while the slightly smaller RPV-class destroyer was present during the Battle of Sigma Octanus IV in July 2552. A much larger class of destroyer, the super-destroyer, was fielded during the Battle of Harvest on March 1, 2526. In general, Covenant destroyers are very well-armed, boasting multiple point-defense pulse laser turrets, plasma turrets, energy projectors, and a full complement of Type-31 Seraph fighters. The destroyer's weapons are so potent that UNSC Navy Captain Jacob Keyes remarked that they turned UNSC ships into "Swiss cheese" in many engagements. This warship classification features the distinctive three-section design of most heavier Covenant warships, mirroring the deadliness of its larger counterparts. Destroyers are often used as escorts for fleets or task forces and are able to hold their own in combat, while protecting more valuable ships from enemy threats. A pair of Covenant destroyers glassing the planet Harvest. A Covenant destroyer colliding with the UNSC Spirit of Fire. Three Covenant destroyers glassing Harvest on the back cover of Halo Wars: Genesis. Concept art of the Covenant destroyer for Halo Wars. A Covenant destroyer, as seen in Origins.